A few of the many pictures from the 2010 season. More will be posted over the winter. You can also see a lot more on Facebook (http://www.facebook.com/voltagp). and Jeff Navin is third by dint of Ary having more wins. All results of each driver may still factor in the overall championships because the best 30 results from the entire season count toward that. Last Sunday’s Formula 1 race in Monaco had a very unsatisfying conclusion. Depending on your point of view it ended under yellow or it ended under green conditions. Michael Schumacher believed it ended under green and passed Fernando Alonso to move from seventh to sixth place at the finish. The stewards, however, felt otherwise and after three hours of deliberations judged Schumacher to have passed during a Safety Car (SC) or caution period and assessed him a 20 second penalty, moving him back from sixth to 12th position. Do the drivers get to race the last part of the last lap after the SC pulls in or not? If the drivers can race at that point then Schumacher is right. If drivers are not allowed to race at that point, then the flags should have stayed yellow and the SC should have remained on track. The stewards had to debate what is a simple yes/no question. The sanctioning body has to know exactly what the situation is at all times during an event. Then it must do the utmost to make sure all competitors are aware what that situation is and then control it. Further, the penalty assessed was completely arbitrary and has no basis on the advantage gained. Why 20 seconds? Where is the precedent for that? There is no "penalty schedule" which states “if you break this rule, you will be given this penalty”. The whole organization is just flying by the seat of the pants and pulling these decisions out of thin air. What they should have done if Schumacher was judged to have broken the rules was put the finishing order back to what it was under the SC, and fine the driver or team (based on fee schedule with precedent) to discourage such breaches in the future. But to now allow the result of the race to be dragged further into an appeals process is ridiculous. One of the greatest sins in any sport is to change competition results long after the fact. Maybe within the first few minutes, but none of this non-sense of fixing the result weeks or months later. Some on-board footage I took at a Summit Point Kart Enduro. 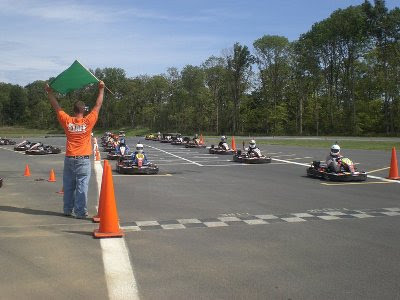 Lots of karts and lots of passing. I was in the middle stint of three. 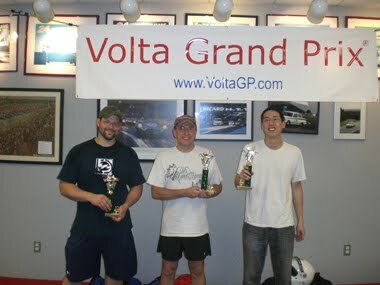 The other drivers were Volta GP regulars Michael Wu and Tony Ward. One of my favorite passes starts around 3:48 (in Part 3). Eric Jones making a nice pass during Round 4 of the championship. As you can see, battery limitations is what I'm working on next. drive-by clip and a pic I snapped. The Volta Grand Prix web site has been revamped. Updates will now be posted on the blog. The "What's New" section will no longer be updated but will still be available for viewing. It just may not look right any more. 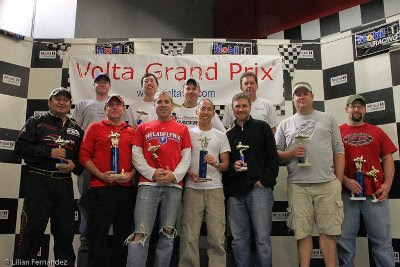 On another note, this weekend we'll be at Allsports Grand Prix for the 4th event of the Volta GP championship series. Immediately after a bunch of us will be going to Summit Point to run a 2 hour team enduro. 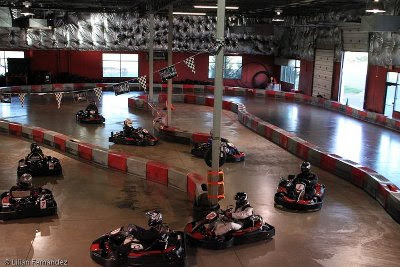 These races are all taking place with gasoline-powered karts. Electric karts are still under development but I expect to make some good headway later in the year on that front. But first thing is first. There has to be a competent pool of drivers to race. Then the technology will follow.